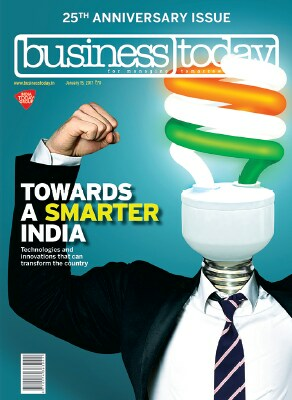 This refers to your 25th Annivesary Issue of Business Today (Jan 15). It was a compendium of smart ideas, smarter concepts and smartest presentations of grand strategies and pragmatic solutions for a better India. The editorial sheds light on contemporary economic history, weak economic growth of India in the past, scope for sustaining high growth rates in future and challenges emerging from technological disruptions. The successful industry captains have placed their unequivocal views based on their personal experience. The entire exercise was highly commendable. Indian policy-framers must extrude an inclusive plan to take the nation forward. Even Niccolo Machiavelli has ruled that nothing can be more difficult to carry out nor more doubtful of success nor more dangerous to handle than to initiate a new order of things, and it underlines the enormity of efforts required to roll out a road-map for India's development and progress and then adhere to it. This refers to your article on digital economy (A Cashless Climate, Jan 15). The use of Internet makes everything highly dangerous as nothing remains a secret. In a cashless society, if Internet connectivity fails, functioning of the entire country would come to a standstill. The best way out is to use Internet occasionally, especially in money matters. There are more chances of losing your hard-earned money to cyber crimes if you use the Internet on a regular basis for financial transactions. Cashless society is a western concept, which is just not practical in India. Cash is required for basic necessities of life. Not everyone is well versed with online transactions. And corruption cannot be curbed through this route. There are hundreds of other modes to receive and offer bribes in order to get things done. The government must be practical and keep in mind the troubles of the common man resulting from the enforcement of cashless policies. No citizen can be forced to keep cash in banks only. The NDA government must take full care of the aam aadmi - not even a single honest person should suffer on account of governent's actions and policies, even in the name of national interest. This refers to your article on IndusInd Bank's performance (The Innovator, Jan 1). The biggest advantage of GLDP (globalisation, liberalisation, deregulation, and privatisation), introduced in early '90s, was the advent of new-generation private banks - with cutting-edge technology - that have come to redefine banking and customer service in such a manner that they are difficult to even comprehend. IndusInd Bank in the private banking space holds a consistent track record. This bank has an in-depth understanding of the market. It is incredible that the bank has a gross NPA level of 1.3 per cent of gross advances during a time of economic slowdown. It indicates a robust risk management profile of the bank. The bank has a strong balance sheet to weather any kind of storms and stay ahead of the times. A good leader is one who is able to lead and steer his team with clarity and confidence, even while keeping them well motivated in their tasks to be achieved. This refers to your article on demonetisation (Paralysed, Jan 1). On this front, Prime Minister Narendra Modi had asked for 50 days to normalise banking operations. But even after 50 days (which came to end on December 31, 2016), there is lack of sufficient cash at the banks or in ATMs. People cannot withdraw cash according to the limit set by the government; instead, the bank's branch decides the amount people can take home. It is only in India that an honest citizen is made to beg for his/her money, kept in good faith at banks. Across the country, people are facing problems in meeting their daily expenses. Moreover, the corruption hasn't reduced, with black money in the form of `2,000 notes being unearthed daily.